"If I had asked what people wanted, they would have said faster horses." I've been wanting to write about this topic for quite some time, and given the recent buzz from Google and others, now seems to be a good time. The topic is self-driving, electric vehicle car-sharing, and I believe it has an amazing potential to change how we view personal transportation. I've mentioned before in this blog the interplay between efficiency and economics of electric vehicles. Electric vehicles may be about $10K more expensive, but they are 1/6th the cost to operate. I had said that in the case of high gas price, EVs become much more economically attractive. They also become much more attractive if the mileage on them increases; the farther you drive, the more you leverage lower operating costs to your advantage. The problem is Americans don't drive enough. Well...I mean, Americans drive plenty, but not enough to currently offset the spread between our extremely cheap gasoline and electricity. In order to make the spread work more in our favor, we have to increase the number of miles traveled/vehicle; that means car sharing. Car sharing is a great idea. We are terrible at making good use of our own cars; we drive them just 30 miles/day on average, and we're in them only for an hour a day, leaving them sitting unused for the remaining 23 hours  (as an aside, the National Household Travel Survey from the US Department of Transportation is a pretty interesting report; you ought to take a look). Car sharing drives up vehicle utility. It was here I realized I was $115 million short on costs. I also failed to remember Zipcar is a company that needs to do things like "pay employees" and "run marketing efforts," so I included those . Not bad for an estimate of an entire company's cost and revenue structure; we're less than 10% off. If we were to wave the vehicle electrification wand, it would primarily impact gas costs (the largest fraction of costs) and vehicle acquisition. To that end, gas costs would now become electricity costs at $23 million based on similar vehicle class efficiency figures (I used the Nissan Leaf)  and 2012 electricity prices . Vehicle acquisition costs would increase to $36 million. In this scenario, revenues are still $280 million, but costs are now $190 million, raising profits from basically break even to $65 million; a healthy 23% profit margin. That was a straight swap of EVs for gas cars in an existing car sharing company. What about invoking the self-driving component? Well, that one is a little tricky. The closest analogy is Uber, and it took some research to figure out how they actually operate, as well as a leaked 5-week snapshot to get an idea of finances . Uber works as the marketplace for taxis and black car services; they actually don't own any vehicles themselves. As such, I don't have a feel for operating expenses like I did with Zipcar. All I know is that from the fare the customer pays, Uber (primarily a software and marketing company) takes 20%, leaving the 80% and the rest of the vehicle ownership, maintenance, insurance, payroll, etc. to the taxi or black car company. Rather disappointingly opaque, but most Silicon Valley startups are like this. Let's consider hypothetically starting our own company using shared self-driving EVs. In honor of rolling out fleets of Google self-driving cars, let's call it "Gaggle" (a terrible name; no one ever use this name). Gaggle's usage statistics are similar to Zipcar's: there are 77 members/vehicle, 6hrs of use/day on each vehicle, 180 miles driven/day in each vehicle. If we use the NHTS data, this means there are 6 trips in each vehicle/day. For simplicity, Gaggle charges on a "per trip" basis; think of it like a flat fee, or like a bus pass. Let's consider 2 scenarios corresponding to 2 prices: a $12/trip scenario and a $6/trip scenario. And let's do a simple payback period analysis where trip revenue pays for the initial purchase of the car. Consider a $20,000 base car, $10,000 for self-driving capabilities , and $10,000 for a battery pack. At $12/trip, the gas and electric self-driving vehicles don't look that much different. Gaggle's electric self-driving vehicle pays for itself in 1.6 years and racks up 109,000 on the odometer, while the gas self-driving vehicle pays for itself in 1.8 years and hits 117,000 miles. The $12/trip cost is roughly half that of Uber and about equal to Zipcar's economics. What about the $6/trip case? The electric vehicle pays for itself in a longer time, 3.6 years and climbs up to 240,000 miles: high but given EVs lower maintenance requirements, definitely achievable (would be about 2500 battery charge/discharge cycles). The gas vehicle on the other hand requires 8.2 years and needs 540,000 miles to pay it back; this is definitely a vehicle replacement, further impacting economics. Due to the lower operating cost of self-driving electric vehicles, Gaggle can offer cheap, convenient private transportation that makes a strong business case for profitability. Gaggle can reduce traffic, reduce pollution, and reduce frustration, all for about the cost of grabbing lunch out. Car sharing has never been better. An article recently cropped about natural gas methane emissions and it prompted me to pick up where I left off about shale gas. For me, this was more of a question about widespread use of natural gas than shale gas in particular, but research revealed shale has some unique attributes that merit particular attention. The whole crux of the matter with methane emissions from natural gas wells and associated infrastructure is, "are methane emissions currently high enough to offset the gains in efficiency from burning natural gas?" Natural gas burns more efficiently in boilers  and power plants , however vented methane from fracking operations and infrastructure leaks has a very high radiative forcing number (86 and 34 at the 20- and 100-yr timeframes respectively) . So, which one wins? Efficiency (less fuel burned means less emissions)? Or leaks (fugitive emissions impact the climate more)? To answer that question, we can take a look at how much more efficient natural gas is over other sources of fuel, the respective greenhouse gas impacts, set a maximum natural gas emission threshold, and then see what the actual leak rate is to determine whether we're over or under. From the EIA, electric power (33%) and industrial uses (31%) are the largest consumers of natural gas , but curiously most of the natural gas in industry isn't in plant and process heating; it's as feedstock (65%) and other non-heat-and-power uses . From that perspective, we'd be fine just looking at the power plant sector. Natural gas is 50% more efficient than coal in power plants , and has half as much CO2 per unit energy burned , so solving for a maximum leak rate, it ends up being no more than 3.3% for the 20-year outlook and 12.5% over the 100-year outlook. Based on an Environmental Defense Fund/Princeton analysis on similar benefit scenarios, our analysis is looking pretty good . So how are we doing now relative to the actual methane leak rate? Well...depends who you ask. A number of papers have been published to look at exactly this problem. A group of professors (curiously from the evolutionary biology department) pegged fugitive emissions from 3.6-7.9% using a 2010 EPA report . They were panned by another group of Cornell professors, this time from a chemical/biological engineering department and earth/atmospheric sciences department , reporting EPA 2011 stating 2.2%. One multi-university team recently measured methane emission directly  and calculated 0.42%. I did my own analysis based on EPA's 2014 GHG report and found 1.0%  . Basically, this is still early science and a precise number has yet to be nailed down, but by the sounds of it, it doesn't appear to be above the 3.3% threshold for the 20-year timeframe. So that means that we don't seem to be doing any worse for the climate from a greenhouse gas perspective by exploiting natural gas, but that also means we aren't really doing any better, and if you believe anything climate models tell us (and really, you should, because they're correct), we need to be doing better fast. Right now natural gas is 85% of coal greenhouse gas emissions if you take the EPA's 2011 value; it could be 55% if we tightened up our natural gas infrastructure. And it's not like we're doing it just for the sake of the climate (though that's reason enough); that's lost revenue. $2.2 billion/year is leaking out from poorly designed and maintained infrastructure and processes, and that's only set to increase if natural gas development expands. If that isn't a business opportunity, I don't know what is. Natural gas currently isn't doing us any real favors right now, but it does hold a lot of promise for significantly lowering the carbon footprint of our electrical grid in a very short timeframe. We need to survey the industry for best practices and standardize them, or help bring to market solutions that would capture that lost value. We also need to seriously consider how to best implement natural gas into our energy portfolio to reduce climate risk exposure. It's not a silver bullet (nothing ever is), but at least it's another bullet in the chamber. I'll be discussing my thoughts on economic and environmental strategies in a final post about shale gas soon. My job is working for a battery startup as an electrochemical engineer. My day-to-day is spent being elbow-deep in the science of batteries. It's difficult work (really difficult; I'll write about it one day), and I'm always learning something new. From time-to-time, a friend or I will come across an article about a new battery chemistry. I've come to learn through many examples that if it sounds boring (silicon anodes, or quinone electrolytes), it's usually big news, but if it sounds exciting (a battery that runs on air! an edible battery! ), it's usually not great. Lithium ion batteries work by shuttling ions between two "intercalation materials." The lithium rests in the crystal structure of a lithium oxide at discharge, then upon charging, shuttles that lithium from the lithium oxide, through the lithium salt electrolyte, and inserts it into the open spaces of a graphite anode, thereby storing energy. The "Ryden battery" is a similar lithium intercalation battery, except that the source of the lithium isn't a lithium oxide, it's the lithium salt electrolyte; there is no solid state source for lithium ions . As such, the capacity of the battery is limited by how much lithium you have in the electrolyte, which is a function of volume and concentration. You don't want to have a large volume of electrolyte because that means it's a greater distance the lithium ion has to travel, increasing ionic resistance, and driving down cell efficiency. Therefore we have identified one limit to cell capacity. Even if you manage to have an exceptionally high concentration of lithium (you can't, btw; it's stuck around 1M for safety considerations ), you're still limited by the specific capacity of graphite, which is the bottleneck in current lithium ion chemistries at around 100-150mAhr/g. Power Japan Plus gives us a diagram showing cell voltage as a function of capacity and the battery stops charging at 140mAhr/g; just what we'd expect. Here is another limit to cell capacity (granted a limit we come across all the time in lithium ion batteries). Finally, all this talk about lithium intercalation into graphite wouldn't be possible unless we had a counter-reaction to balance the charges. The "Ryden battery" claims to use a negative ion intercalating into graphite as the cathode. There are a couple of ions that could do this but ones that comes to mind are halides like fluorine or bromine (I actually couldn't find much literature on the electrochemistry of negative ion intercalation compounds: a bit of a red flag actually). We have other evidence to think this might be the case: Power Japan Plus has a cell voltage of around 4.5V. Solid state electrochemistry is very different than aqueous chemistry, but it still follows similar trends; in order to get a cell voltage that large with lithium on one side, you need a very electronegative electrochemical couple. Fluorine or bromine will do it. In an aqueous system (which is impossible for materials compatibility reasons, but for this exercise let's go ahead and consider it), a LiF battery would have 5.8V, which is close to what the "Ryden battery" is. And fluorine is often featured in lithium ion battery electrolytes, adding support to our guess that the other couple is a halide. This goes against their idea that their all-cotton battery is earth friendly if it contains one of the most poisonous elements on the periodic table. I'm not faulting Power Japan Plus for their chemistry; I'm faulting them for their messaging. If they think cotton in a 3000C furnace (which is just carbon at that point) and fluorine are "earth friendly" then who am I to argue. The long and short of this analysis is we have a battery that has the same fundamental limitations as lithium ion batteries (the graphite anode), with a cell architecture that has serious capacity limits, and questionable negative electrode chemistry. I don't mean to be a killjoy, but energy storage is a serious problem that demands serious answers. This is not one of those serious answers; let's stop treating it that way. I'll first start by saying this post is not to serve as a complete justification or vindication of shale gas and hydraulic fracturing; it is to provide context. Context can make the case seem better or worse than we expect, but either way we walk away a little more informed. That said, I outlined my list of grievances (which I believe most concur with) in my earlier post. I'm going to spike out my major concerns that I think merit a closer inspection first. Let's first start with the 1st grievance, that concerning water. 1) Exorbitant use of fresh water. As I mentioned before, fracking operations use between 4 and 6 million gallons of fresh water in their initial hydraulic fracturing run to break open the shale and release natural gas for roughly a year. I calculated this to be the equivalent of the annual water consumption of 4 US homes per well. There are 400,000 gas wells in the US , and 40% of natural gas now comes from shale source . I'm assuming all wells are equal in capacity (not true, but for our purposes not a bad approximation). This means there are 750,000 homes-worth of water being consumed each year in shale operations. Vikram Rao, author of Shale Gas: The Promise and the Peril, believes that underground salt water can be used for the initial frack and that this should be mandated through regulations. Until best practices reveal the means by which salt water can be used, gas drilling companies will use millions of gallons of fresh water for fracking. I thought this was a lot of fresh water. Turns out it's only part of the story. All thermal power plants require cool fresh water as a heat rejection mechanism. Power plants prefer fresh water over briny water for the same reason fracking wells do: lower risk of scale formation, less corrosion susceptibility, easier materials compatibility. The thing is, power plants use A LOT of water to keep cool. 49% of all water withdrawals in the US is for power plant cooling. That's 200 billion gallons a day. That's a little less than 2 Mississippi Rivers-worth of water. The next closest is irrigation to grow our crops at 31% . I find this number staggering. Admittedly, this is for withdrawals which is different than consumption, and depending on the type of cooling system used, a lot of that water may be returned to the environment. Regardless, it's still a large number that dwarfs the water consumption used in fracking. A report from the Harvard Kennedy School estimates that water used in fracking constitutes less than 10% of the water consumed when shale gas is used in a high efficiency combined cycle gas turbine and low-water consumption recirculating cooling (the typical construction cases these days), and that this is a factor 2 lower water consumption/MWh than coal (which uses 2x as much water/energy content in washing coal than fracking) and factor 4 better than nuclear . The Kennedy report is quick to add that hydraulic fracturing water consumption can stress water resources locally due to the short-duration/high-rate at which water is consumed, even though the gross consumption is relatively small. I'll add that the water consumption for wind and solar PV are essentially zero. There's a few things I think are important to point out here. The reason natural gas comes out so far ahead of coal and nuclear is mainly due to power plant thermal efficiency. If your power plant is less efficient, more thermal energy needs to be rejected for a given amount of work, so more water is necessary to keep things cool. Combined cycle gas turbine plants are basically two power plants in one (a gas turbine top cycle and steam turbine bottoming cycle), and as such run somewhere in the vicinity of 45% efficient. You can't run a gas turbine on coal (some people are trying though), so you can't leverage a topping cycle, so you're stuck with just one steam turbine cycle and an efficiency of about 33%. Nuclear is de-rated on efficiency for safety and process considerations, so comes in around 29% . The other element I was surprised about was the water intensity of other energy extraction processes. As I mentioned earlier, coal mining is about 2x more water intensive that natural gas fracking, and uranium mining 10x more intensive. It seems to me that not only are we using too much fresh water with even our lowest demanding energy process, but we completely ignore significantly more demanding processes. I find that concerning. The silver lining about all this water research is the fact that 2 renewable energy generation methods, wind and solar PV, use no water at all. This point I believe should be emphasized. I think that water use in energy generation is actually a really big problem. It seems in this regard shale gas and hydraulic fracturing for combined cycle gas turbine plants are actually better than the conventional coal or nuclear power plants. While water is a large problem, it's not the only one. We'll look at other environmental impacts in subsequent posts. Shale gas and hydraulic fracturing is a lighting rod topic in the clean technology sector...which is why it's so much fun to write about. In analyzing the topic over several months, my personal opinion has changed from that of "shale gas is a tempting distraction from what we really need: energy efficiency, wind/solar deployment, electric vehicles, energy storage" to "shale gas and hydraulic fracturing isn't that bad, and the wealth creation, if invested properly (and it needs to be), can fund deployment of more expensive energy systems while still achieving climate goals." I'm first going to write about what is shale gas and what the risks are. I'll discuss why some of my major concerns are reasonably addressed and how we could best manage this newly available energy source effectively in two separate follow-up posts. Let's first define a few things. "Shale gas" is natural gas (methane) and natural gas liquids (larger molecules in a liquid state found with methane: ethane, propane, and butanes) found locked up in impermeable shale rock (sedimentary rock made from compacted mud, clay and silt). Because of how common the conditions are for shale gas to be formed (350-500 million years ago, algae died and settled on the bottom of sea and river beds, covered by silt and clay, and cooked under pressure and temperature), there's a lot of it. Shale gas has been rendered an economically viable source of natural gas by "hydraulic fracturing," which is a process of drilling down into gas-containing shale, injecting high pressure water, sand, and some chemicals to break open the impermeable rock and increase porosity, allowing the gas to flow out and be collected. "Proppants" like sand hold open the fissures, allowing the pressure to be relaxed, the water removed, and gas to flow out. The water that comes back (not all of it does; most stays injected underground) is called "flowback water." The water, sand, and chemicals are pretty key components to the hydraulic fracturing process. One well will use between 4 and 6 million gallons of water in its productive lifetime, which is about 1-2 years. To put this into context, it's about 10 olympic swimming pools, or the amount of water that 4 average homes will use in a year . That's a lot of water for one well. In terms of what's also injected, water makes up ~92% of the fracking fluid, sand ~5%, and the remaining 3% is chemicals comprised of (mostly) acids and pH buffers to prevent scale build up (more on that), biocides to kill bacteria that would return topside with the flowback water, and detergents and oils to change fluid properties. The blend and chemicals change from location to location and are optimized for a given geological area. As I mentioned, most of the water (and chemicals) stay injected in the well: 65-85% of the injected water stays underground and 90% of the chemicals are either consumed in process (like acids removing scale) or also stay underground. The stuff that comes out is salty. Super salty. Like 10x saltier than ocean water. Stuff that's literally 25% salt. And there's 1.5 million gallons of it to deal with. That's 100 tanker trucks. Of super salty water. That you can't simply pour into the nearest river. In almost all cases it's trucked to special EPA-controled injection wells that basically bury the salty brine in similar geological structures as it came . The reason the fresh water that goes in comes out super salty is because the water that's already down there has been sitting in minerals and rock formations for hundreds of millions of years; the fresh water mixes with it and flushes some of it up to the surface. Of course after the water comes out, the natural gas that we went through all this trouble to get finally comes out. A well will produce about 250,000-400,000 thousand cubic feet over its lifetime (enough to heat 6500 homes for a year ), and at $4/MMBTU (million BTUs) and 1 thousand cubic feet per MMBTU, is valued at $1-1.5 million. But natural gas isn't the only product that comes out; there's also natural gas liquids (NGLs). These are higher-valued commodities that can replace oil as petrochemical feedstocks, and as such are priced similar (but at a slight discount) to oil: something like $70/barrel (42 gal). In current gas plays, there's about 4-12 gallons of NGLs per thousand cubic feet of natural gas. This means that the value over the course of the well is something north of $3 million for NGLs. Most of the value is in these commodity chemicals. This weight toward NGLs basically means that natural gas is viewed as a byproduct and suggests that low prices will continue for some time. In a second post, I'm going to address 1 and 4 directly with personal analysis, as they were my primary concerns when I started learning about shale gas, and I'll discuss what I've learned about 2, 3, and 5 from research. I'll write about 6 in a final post as I think it merits a greater discussion. Soooo...yeah. There's a lot going on with shale gas. My 3 little (alright, maybe not so little) posts are certainly not going to be the final say on the matter, but I hope it at least puts things into perspective and adds some understanding. I've run out of things to be concerned about. I originally thought water would be an issue; apparently two people can live comfortably continuously on a 15'x25' water collection footprint, and 4-6 can for a weekend. There's ample power to run the various infrastructure systems. And there seems to be enough space. I'll add that blackwater (i.e. sewage) processing seems to be an open question. Septic systems and aerobic digestion systems still require periodic sludge removal and composting toilets aren't all that familiar or easy to use (I did this research while having dinner last night: not the best idea). I now understand why the Bill and Melinda Gates Foundation is funding 15 teams to reinvent the flush toilet; waste treatment still is a hard problem to solve. Bottom line is living comfortably off of naturally locally available resources isn't nearly as hard as I had originally expected. With some good engineering and clever design, a very comfortable, modern, sustainable living can be made. 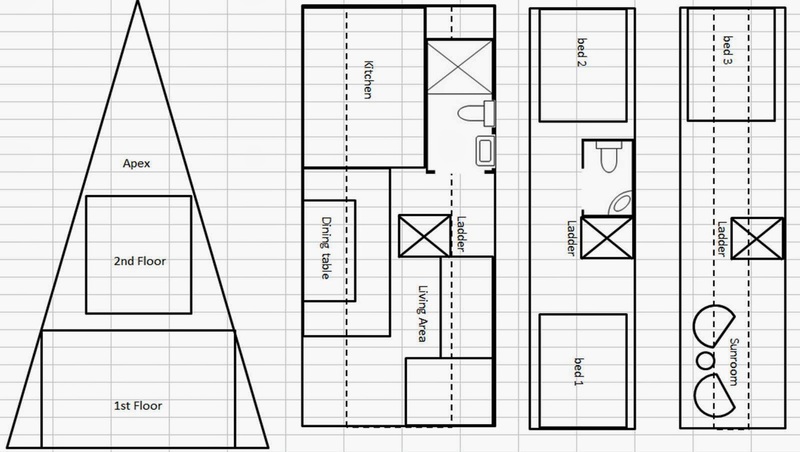 Last night I had released the output of my model for a zero-energy, off-grid cabin designed for upstate VT. I've been thinking a little more about it and have made some updates. I've also torn a page from Thoreau and decided some conclusions drawn from the exercise might be worth going over. 1) I haven't given adequate consideration to ventilation. Without good ventilation, issues from general stuffiness to mold can occur: not good things. Running the numbers I was surprised how much it mattered. I used some of the passive house standards, which rely on air-to-air heat exchangers to reduce heating loads. To comply with 0.6 air exchanges/hr with an 80% eff HX, I need to add 5.5 kWh/day to my heating load (10x my previously calculated heat loss). I also need to change the layout of my floors. Previously the only floor-to-floor ventilation was through a small 3'x2.5' ladder opening. I've set back the 2nd floor and apex floor to also permit a 6'x3' opening from ground floor to roof. Such an arrangement allows for better floor-to-floor ventilation and, if the top windows can open, a passive cooling structure powered by the morning sun as well. Set-back 2nd and apex floors for ventilation, plus proper orientation. 2) I've also updated my water usage requirements. Turns out my first consumption estimate was too high. This might be filed under TMI, but it can't be as bad as other "living as nature intended" blogs I've read or come across. My shower estimate assumed 10min of water use at 2gal/min. I timed myself this morning before work just to see. I take "naval showers" (water on -> wet up -> water off -> lather up -> water on -> rinse off -> water off) not for environmental considerations, but out of preference; I'm not a small guy and my shower stall reminds me of that on a daily basis. That said, having timed my morning shower, it's a comfortable 5 min of "water on" time, thus cutting my consumption in half. I've updated my water consumption model to reflect that, and found that I could squeeze 4 naval showers with a low-flow shower head (4x10gal), 1 load of dishes in an EnergyStar dishwasher (4 gal), and 1 load of laundry in an EnergyStar washing machine (40 gal!!!) per week. This is perfectly sufficient for 4 people for the weekend or 2 people living continuously. I was actually a bit surprised by this, as water use seemed to have been the hardest constraint to satisfy. - The biggest drivers were heating: incoming air for ventilation and hot water for cleaning. I find that pretty remarkable. With respect to heating air, the amount of energy is dependent on number of air-exchanges/hr, which is entirely determined by the volume of your house; heat loss through insulation can be made marginal, but air-exchanges are a big sink. Smaller house -> lower energy consumption. Period. With respect to heating water, it's all about consumption; using less water means having to heat less water. A real win-win. We really should do what we can to cut back on hot water consumption. - As I mentioned before, the hardest challenge was water consumption. I really think this is telling as I believe that our future will be water constrained more than power constrained. In this example, if I needed more power, I had plenty of room for more solar panels; it would just cost a little more. If I needed more water, I was in trouble. Water conservation is a serious thing. I'll discuss more about it in another post. - All in all, the exercise wasn't that hard; in a day I managed to put together a design for a small cabin with rainwater collection, greywater recycling, solar thermal heating, and PV-sourced electricity that featured all the comforts of modern living: heat, hot water, internal plumbing, TV, ventilation, oven, refrigerator, dishwasher, washer and dryer. This cabin could comfortably house 4-6 people over the weekend (giving time to bank water and power resources through the week), or 2 people continuously. By my estimates, it costs about $200K: same as the median house price in the US. In short, it's a pretty serviceable home, implying I don't think that zero-energy homes are some future fantasy, but a realizable present option should people want to pursue them. I really liked this exercise. 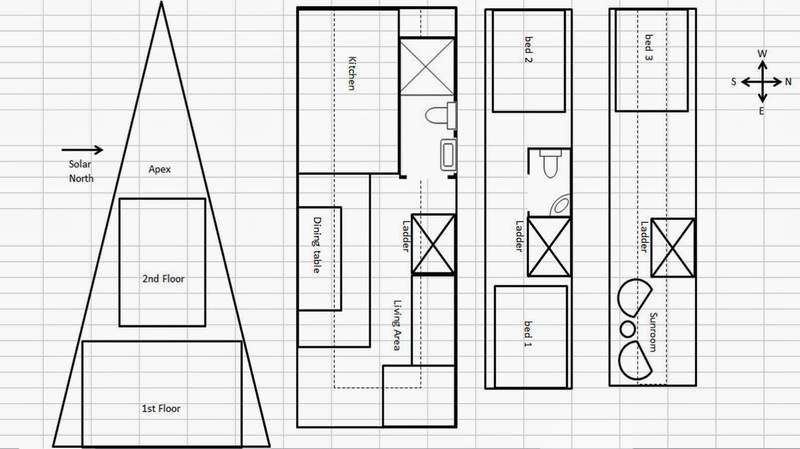 I'm surprised-but-kinda-not that I was able to design a comfortable home that was completely off-grid. I'll see what I can do to upload the model for review. It's always been a dream of mine to have a cabin in the woods as Henry David Thoreau did...though perhaps more of a comfortable ski cabin in VT than a small shack on a lake in MA...so I guess not as much as Thoreau as I'd like to let on. Either way, the thought stuck with me so unrelentingly today I had to put it all down on paper. First, let's identify our constraints. In building his cabin, Thoreau scavenged for his building materials. I'm looking for something a bit nicer, so the option is to either build it on-site (difficult to do in remote locations), or build it pre-fab and ship it. Being more a fan of the latter, you can't just slap on any size house on a truck; they're usually pre-fab modules less than 15' wide and 30' long. So let's choose a footprint 15'w and 25'l. Second, let's assume we're remote enough such that we don't have access to power, water, or sewer connections.This is where things get interesting... In designing zero energy homes, two goals must be simultaneously achieved: maximize power production and minimize energy consumption. Maximizing energy production in our remote area will be achieved by solar energy (PV and flat plate thermal), and minimal energy consumption is done chiefly through heavy insulation and good resource (namely water) management. Since we're relying on the environment for our water and power, we have to take into consideration our area's solar insolation and average rainfall. I've chosen upper VT with data from the new US Climate Data website and NREL  . Finally, some aesthetic considerations. I've always liked A-frame houses; I think they're well designed for low-energy homes in wintry climates, so let's use that as our model. My model outputs a 575 sq. ft. cabin with room for 3 queen beds and 1.5 bathrooms, a large 10x7 kitchen, and plenty of space space in the wings for infrastructure. Using some estimates from David MacKay's amazing book Sustainable Energy without the Hot Air, I've estimated a 10kWh/day electricity usage and 14kWh/day thermal usage (almost all of which is in warming up water). To satisfy that demand, 33m2 of 10% solar panels in VT's 3 kWh/day/m2 solar flux would do it, same with 7m2 of 65% efficient flat plate water heaters for the thermal load. Those areas may sound like a lot, and they are, but another reason for my choosing an A-frame house is the very large roof area to work with. Roughed out section and floor plan. Things are about to scale. Because of the large roof space, power isn't a problem; we're taking up just over 60% of the south-facing roof. The high-sloped roofs and small footprint do resort in another problem though: water availability. Remember, I'm leaning on rainwater collection instead of a city water connection. I've calculated that only about 90 gal/week of water is available during the dry winter months due to lack of rain fall, rising to just over 225 gal/week in the summer. 90 gal/week is nothing; it would be the equivalent of 4x10min showers with a regular high-volume shower head. It certainly isn't much beyond a weekend cabin during the winter. I'm trying to stretch that out with low-flow shower heads, a recycled greywater system for flushing toilets using sink/shower/dishwasher effluent, and large cisterns to hold about a month's supply of water. I did learn a couple of things, especially about plumbing. I originally thought water pressure was going to be a huge problem, and started to work on a fancy gravity-based system, but I learned that there exists simple automatic pumps that turn on and deliver 40+psi pressure when they sense an open valve down the line. I also learned that while rainwater can be held for a while, greywater must be disposed of no later than 72 hours or else the organic content in it turns foul. You can also apparently run a septic system in freezing climates, provided you just dig down far enough below frozen ground (+18"), hence my choice of septic system vs. composting toilets. Apparently my blog isn't the only thing that has risen from the dead. FastCompany ran an article a month ago about the downfall of one of the companies I worked for: Better Place. The company had folded over a year ago; I'm not entirely sure why now would be a relevant time to discuss them, but I'm glad Better Place is getting talked about again. I had a lot of respect for what they were trying to do, which was to make EVs financially attractive. Electric cars are remarkable. The powertrain is 80-90% efficient, compared to a gasoline car's 10-20% efficient engine and transmission. This makes a huge difference in operating costs. If you put $20 worth of gas in a 22mpg gasoline car, you'd get 120 miles before the tank runs out  at today's gas prices of $3.70/gal . If you put $20 worth of electricity in something like a Tesla Model S, you'd get 670 miles before you run out of juice . Electric vehicles are so economical to run because 1) the powertrain is so efficient, 2) the electricity to run them is so cheap. The problem is the battery is pricy, so even though an EV is less expensive to run, people won't buy them because their upfront costs are too high (consumer discount rates w.r.t. energy efficient appliances, EVs included, is a fascinating energy economics post for another time). Let's do what Shai Agassi likely did when he decided to found Better Place and look at the economics of EVs relative to gasoline cars. We already did the math saying EVs are about 6x cheaper/mile to run. If we take Tesla's quoted cost of the replacement battery of $10K, how far would we have to drive to make up that cost difference? With $3.71/gal gasoline, $0.10/kWh electricity, a 22mpg gas car vs. a 3mi/kWh EV, it comes out to be about 70K miles: less than the standard lifetime mileage of a car, but not much less. There's a business case to be made, but not much of one given the slim margins. What about Shai's home country of Israel? Turns out they pay about the same electricity prices as we do, but pay far more than we do for gasoline: $8/gal  . That means $20 would only get us half as far: 55 miles in Israel instead of 120 in the US. Taking this into account, we would only have to drive 30K miles to make up the additional cost of the battery. Everything after that would be savings to the customer, or profit to a company. This is a far more promising business case, and indeed it was the case that Better Place was founded on. The math here is greatly simplified. We simply talk about the marginal cost of the battery pack, when in fact there's other cost differences that bring EVs more in-line with gas car costs. We also neglect infrastructure costs, which might matter if you're trying to build something expensive like battery swap stations like Better Place or superchargers like Tesla. The lessons learned from the exercise don't change though; EVs make sense now, and Better Place wasn't founded on some idealist's whimsical fantasy. Dead ideas like amateur blogging or voyeuristic post-mortem news articles might keep coming back long after we thought we buried them, but live ideas with a spark in them, like electric cars, will always stay alive and kicking. Almost 3 years to the day, I've returned to blogging and social media. Why? Well, a lot has changed since then. I started this blog when I was considering working for MIT Facilities as an energy efficiency engineer. My job for them would have been to expand on my work starting the Dorm Electricity Competition (an energy conservation competition) as an undergrad at MIT, and I had hoped that writing about it would motivate me further. Instead, I got an offer from the company I was interning at, Sun Catalytix, and chose to focus my career there. Since then, our modest company has developed one of the cheapest, highest-performing electrolyzers based on an MIT-developed catalyst; invented the world's first practical artificial leaf; and are now working to commercialize a low-cost flow battery based on an entirely new class of chemicals for energy storage. In short, it's been hard to find time to keep up. Even though I've been hard at work in the lab, I've still been reading up and researching the rest of the energy sector. Friends would occasionally email me with questions or news articles asking for my thoughts. A recent conversation with a friend who had asked me, "weren't you doing that blogging thing a while ago?" had spurred me to simply move those conversations to a more public setting. And with that, I'm restarting my blog. With any luck, I'll update more often than once every 3 years.